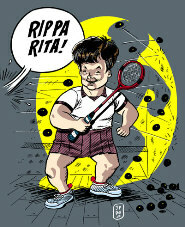 Have you ever had this little niggle in the knees during or after playing squash? I guess it will depend whether there has been any weakness in the knees prior to playing squash too. So that creates other thoughts on how to nurture the knees during and after playing. Did you know the action of stamping the foot before hitting the ball can cause a jarring effect to the knee joints, enough to cause some inflammation. Do you wear the correct footwear? The sole of the shoe must not stick to the floor as that can put extra strain on the ankles and knees as the body twists and turns. Always buy squash shoes, and don't play in your joggers or gardening shoes, for safety sake. The soles and treads of squash shoes are purpose built. For those who jog, choose a suitable soft surface, the pavement can be very hard on the legs. Stretching of the quads, calf and hamstring muscles will also assist recovery from tightness in the legs. Strength of the quads affect the stabilisation of the knees. After looking at the photos of our World Ranked players, it is obvious by the muscle definition that their quads are well developed, and the knees look very tort. Here are some discussion points about knees. Slavi, when you come to Australia on holidays please run on the grass as it is kind to the knees and feet. Jokes aside. Maybe there are synthetic tracks/ovals available as an alternative idea. Once a week outdoor stuff is good, and also the running interdispersed with 100m sprints is ideal for squash training. Ok I guess you could set the running machine to this kind of pattern as well, and no dogs will bite you either! We sure have to look after our joints whatever happens. Does squash destroy your knees? Advice on runners with good knee support. The videos look really good to me, Good levels of lighting and a nice camera angle for the ones i have looked at.